Anything that you can imagine for yourself is possible. We are all powerful creators.Read on and learn to create the life you have always dreamed of. ?Would you like to design your own future? Your life can have limitless possibilities and opportunities. Your business, professional and personal life will be enhanced by learning these principles. ?We all, as human beings, want basically the same things in life. To be happy and content, to be successful and to not be held in check by the limitations which are often placed upon us, usually by our own fears. 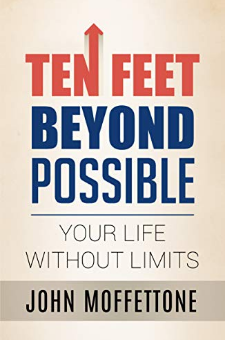 ?In this ground-breaking new book, Ten Feet Beyond Possible: Your Life Without Limits, you have the chance to see just how you can achieve the success and happiness that you deserve, by using a ten-step program which includes:? ?Discovering that anything is possible,Achieving balance,? ?Removing the obstacles that get in the way of happiness and success,? ?Discovering the genius within you,? ?Developing peaceful rituals,? ?Discovering your unique purpose? ?And much more…?? ?Now, you can have the kind of life you once only dreamed of.Get your copy now! Make a difference!